Fisheries biologist Chet MacKenzie from Vermont Fish & Wildlife with a lake sturgeon captured and released this spring in the Winooski River. RUTLAND – The Vermont Fish & Wildlife Department is reminding anglers of the state regulation applying to lake sturgeon, as well as the need to help protect the endangered species through responsible angling practices and by reporting catch information to the Department. MacKenzie also encouraged anglers to help with the Lake Champlain sturgeon restoration effort by minimizing injuries to any accidentally caught sturgeon. Vermont Fish & Wildlife urges anglers to help population recovery efforts by reporting any sturgeon they catch to the Department at 802-878-1564, or by contacting their local fish and game warden or district office. 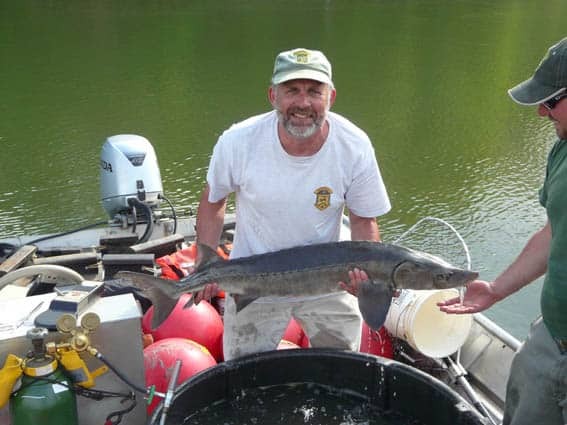 Information obtained about sturgeon catches can be valuable to the Department’s sampling efforts and to monitoring the trend in sturgeon abundance over time. Anglers and members of the public are also asked to report illegal sturgeon harvest to law enforcement immediately by calling their local warden, a state police dispatch center or Operation Game Thief at 1-800-752-5378. Lake sturgeon, which in Vermont are only found in Lake Champlain and the lower sections of the Winooski, Lamoille and Missisquoi rivers and Otter Creek, are a unique, ancient form of fish that were first given complete protection by law in 1967. Lake Champlain has the only lake sturgeon population in New England. The fish were historically more common in Lake Champlain, but declined rapidly in the 20th century due to overfishing and loss of spawning and nursery habitat caused by the construction of dams. Adult sturgeon are typically three to five feet long and weigh up to 80 pounds. The largest on record in North America weighed over 300 pounds, and the oldest was 154 years old.